What our customers are saying about our Holiday Cottages In Ludgvan To Rent. "Very comfortable, and close to many places to visit. Very relaxing!The cottage was the best we have stayed in since using HH. All home comforts were there, with fine detail to comfort,.We were sad to leave such a fantastic area and home and would love to return one day.Nice touch having salt/pepper/vinegar/tea/coffee/sugar etc which you don't usu get so had brought with us. A very happy stay! Flowers and welcome Cornish drink and biscuits also appreciated.Much thought has been taken to ensure everything needed for a comfortable stay is provided. With Cornwall's variable weather the woodburner is an added bonus and it was just so lovely to have a plentiful supply of wood - one less thing to worry about. I also think having a washing machine, rotary drier and airer are great practical essentials that many other cottages don't provide. A particularly lovely touch were the little welcome gifts left for us on arrival, after a long journey this was so considerate. 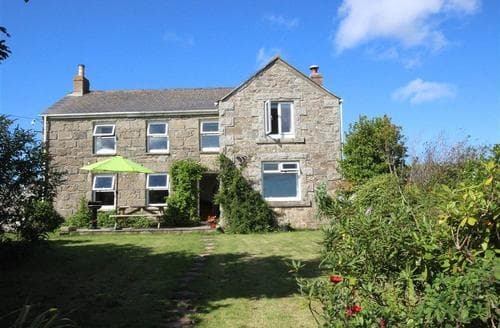 Location wise the village is terrific, away from it all, yet close enough to the growing infrastructure of Penzance. 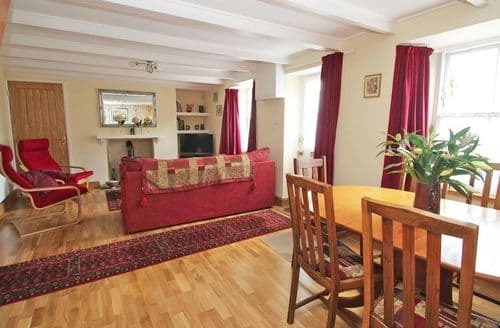 This was our second visit to this cottage and I would definitely choose it again." 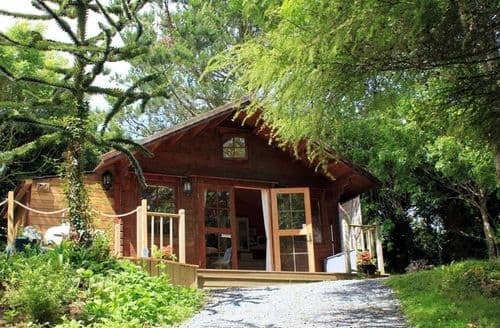 "The cottage was the best we have stayed in since using HH. All home comforts were there, with fine detail to comfort,.We were sad to leave such a fantastic area and home and would love to return one day.Nice touch having salt/pepper/vinegar/tea/coffee/sugar etc which you don't usu get so had brought with us. A very happy stay! Flowers and welcome Cornish drink and biscuits also appreciated.Much thought has been taken to ensure everything needed for a comfortable stay is provided. With Cornwall's variable weather the woodburner is an added bonus and it was just so lovely to have a plentiful supply of wood - one less thing to worry about. I also think having a washing machine, rotary drier and airer are great practical essentials that many other cottages don't provide. A particularly lovely touch were the little welcome gifts left for us on arrival, after a long journey this was so considerate. 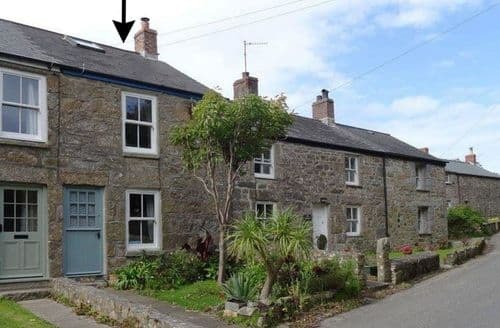 Location wise the village is terrific, away from it all, yet close enough to the growing infrastructure of Penzance. 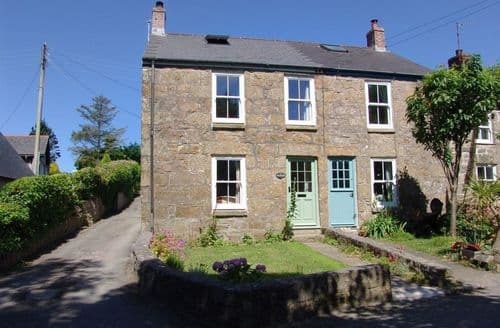 This was our second visit to this cottage and I would definitely choose it again." 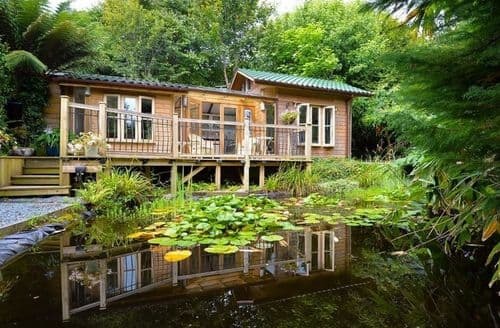 "Sue (the owner) has created a blissful and secluded retreat with S123193. It's a great place to stay where the only noises you can hear are the birds, the breeze and the stream babbling down through the woods. 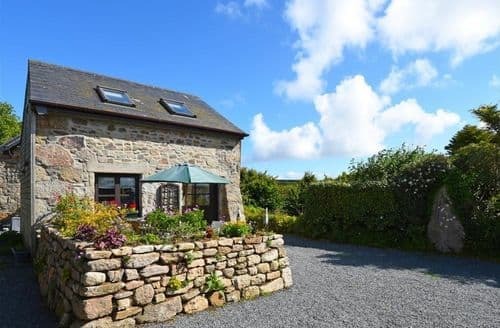 It's situated close enough to beaches and towns like St Ives (15 minutes) and only 40 minutes from Truro, if you're missing the City life.Good weather apart from Tuesday. Excellent gardens close by and visits to various other attractions.Very relaxing and in an amazing setting. Lovely to be able to sit out on the verandah and not hear anything but birdsong. A short drive to the A30 means the lovely beaches nearby can be reached easily. An absolute gem and a credit to Sue's (the owner) vision. Being able to look up at a tree fern whilst I shower is a first for me! Will definitely be back.Such a fun weekend especially as my partner proposed to me on Saturday 13th February and I said yes - very special place for us and can't wait to return. Thank you for a beautiful experience." "Nice touch having salt/pepper/vinegar/tea/coffee/sugar etc which you don't usu get so had brought with us. A very happy stay! Flowers and welcome Cornish drink and biscuits also appreciated.Much thought has been taken to ensure everything needed for a comfortable stay is provided. With Cornwall's variable weather the woodburner is an added bonus and it was just so lovely to have a plentiful supply of wood - one less thing to worry about. I also think having a washing machine, rotary drier and airer are great practical essentials that many other cottages don't provide. A particularly lovely touch were the little welcome gifts left for us on arrival, after a long journey this was so considerate. Location wise the village is terrific, away from it all, yet close enough to the growing infrastructure of Penzance. 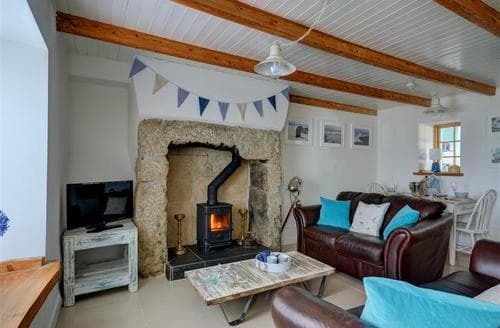 This was our second visit to this cottage and I would definitely choose it again." "Kitchen not as described in details (no breakfast bar). Constantly chasing Sykes for replies to e-mails and failure to understand the issue. Very noisy road with quarry lorries going past 7am onwards daily except weekends. Shower available for 5 minutes max with next person having to wait for tank to fill, what's that about? Pub is actually 30 secs away not 5 minutes. Parking at S82018 can be an issue when pub is busy. Tumble dryer would be useful especially as rotary washing line not great. Change of sheets at end of first week would have been welcome. No hand towels in kitchen. Confusing Property Details folder which states pets to be exercised off premises? Owner arrived on our leaving day and did not introduce herself and said she was checking cleaner had arrived? See separate complaint/follow up."